One of the reasons behind the market's euphoric burst last Friday and spike in the Chinese Yuan on renewed "trade optimism" is that among the numerous soundbites and flashing red headlines, was that the US and China had reached a currency deal that would prevent Beijing from depreciating the yuan, even though no details were released. 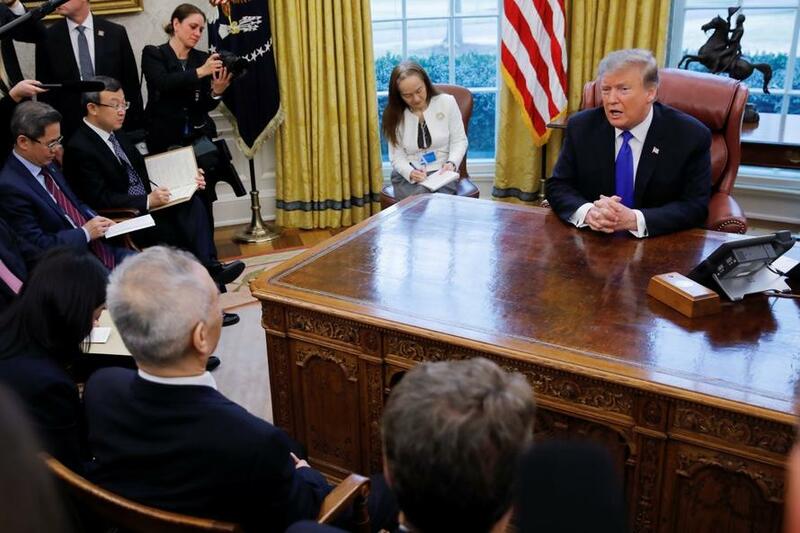 “We have a deal on currency manipulation,” Trump told reporters during an Oval Office meeting with Chinese Vice Premier Liu He, the head of a large Chinese delegation that’s in Washington for talks aimed at defusing the U.S.-China trade war. There is just one problem: like most other "deals" reached between the US and China in the ongoing trade war, this one too may not have been worth the paper it has yet to be printed on, because as Bloomberg reports, the two sides haven’t yet agreed on the critical issue of enforcement in a proposed currency deal that would ensure Beijing lives up to its promise to not depreciate the yuan, four people familiar with the matter said. As a reminder, on Friday, Treasury Secretary Steven Mnuchin touted the currency pact first announced by president Trump as the strongest ever, though he offered no details and with the lack of an actual enforcement, one can understand why. Citing sources, Bloomberg said that the success of any currency deal, or pledge, which in turn will form the backbone of a greater trade agreement, hinges on what enforcement mechanism the two countries decide on for the entire agreement, as Beijing has repeatedly failed to follow through on pledges to carry out reforms under previous administrations, the White House contends. U.S. Trade Rep Robert Lighthizer said any deal with China needs to contain a strong enforcement mechanism to ensure long-lasting changes to the trading relationship. The White House has complained that Beijing has failed to follow through on its pledges to carry out reforms under previous administrations. One option to "enforce" the currency deal is the possibility for the U.S. to increase tariffs on Chinese goods if Beijing breaks its word, in other words the so-called deal that is about to be reached, will be contingent on China never again suffering another major currency outflow, economic contraction, or major monetary or fiscal stimulus both of which would send the Yuan sharply lower. Needless to say, a deal with so many inevitable "outs" is laughable. Meanwhile, with the two sides seeking to formalize some deal, or even a MoU, on paper ahead of the March 1 deadline to hike tariffs, the discussions were extended into the weekend. In tweets early Sunday President Donald Trump declared Saturday’s talks “very productive” and offered praise for Chinese President Xi Jinping leading into this week’s meeting with North Korea Kim Jong Un. Others were less excited: trade hawks such as Lighthizer said on Friday that the negotiators have made progress on structural issues related to the Chinese economy but still face obstacles. “We have major hurdles,” he added, although headline-scanning algos were happy to gloss over that distinction. The algos may have a point: according to a WSJ report, Trump appears to have grown weary with the trade war, especially after the market swoon in December, and is looking forward to putting it in the rearview mirror. As the Journal reported late on Friday, "China hawks in the business community, the administration and in Congress say they are troubled by what they see as Mr. Trump’s growing impatience for a deal, and are urging him to stand firm and insist China make fundamental changes in its industrial policies." Ironically, it's the democrats now who are accusing Trump of not being tough enough: “I am encouraged by signs of progress, but remain concerned that the president will accept a quick offer of procurement of U.S. goods rather than fundamental reforms to China’s systemic problems,” said Rep. Bill Pascrell Jr., a New Jersey Democrat. The bottom line, however, is that for now, the two sides still remain far apart on the major issues involved in the discussions: Chinese government pressure on U.S. companies to transfer their technology to Chinese partners; subsidies for Chinese state-owned firms; and protection of intellectual property. The two sides also remain deadlocked on how to enforce any agreement. In the end it will be all up to Trump: how does he spin a watered-down version of a deal with China, one without major concessions from Beijing, with some vague promise to import a $1 trillion in US products over the next decade without any specifics, and without an enforceable pledge on what the White House dubs currency manipulation, as a "victory" without disappointing his core supporters who have seen the ongoing US-China trade war increasingly as the framework of an ideological battle between the two superpowers. And judging by Trump's tweets, and retweets, the stated reason for conceding to a deal - largely on China's terms - will be China's promises to buy more... soybeans.